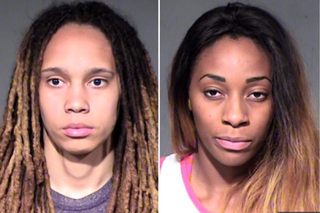 Brittney Griner and her fiancee, Glory Johnson, were arrested on suspicion of assault and disorderly conduct April 22, 2015, after police were called to the Phoenix-area home they share and reportedly found both women bloody. WNBA players Brittney Griner and her fiancee, Glory Johnson, both 24, were arrested Wednesday for a domestic dispute that included allegations of assault. According to AZ Central, Griner, center for the Phoenix Mercury, and Johnson, a forward for the Tulsa Shock, were arrested "on suspicion of assault and disorderly conduct." AZ Central notes that Griner was released around 4 a.m. Thursday. Griner, who was the No. 1 pick in the 2013 WNBA draft, is one of the biggest stars in the league, having led the Mercury to a WNBA title in 2014. "She was named the league's Defensive Player of the Year, in addition to being named All-WNBA First Team," AZ Central reports. According to a police report obtained by TMZ Sports, Griner told police that the couple had been fighting for days and were having serious "relationship issues." The couple announced their engagement last summer. According to TMZ, an argument at the home the couple shares in a Phoenix suburb turned physical after Griner allegedly threw a dog bowl at a wall. Glory's sister, who was at the couple's home, reportedly called the police after several people "couldn't get them pulled apart." TMZ notes that when the police arrived, "officers say Brittney had several cuts—and a bite wound. Glory was bleeding from the lip." "The Mercury organization is aware of an alleged incident involving Brittney Griner," Phoenix Mercury Executive Vice President and General Manager Jim Pitman said in a statement released Thursday. "We are in the process of gathering additional information, and will have no further comment at this time." Read more at AZ Central and TMZ Sports.